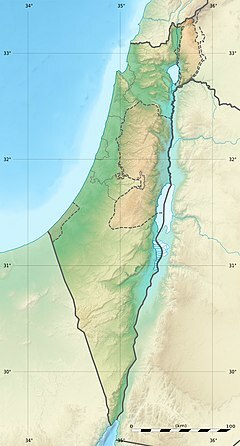 Nahal Oren is an archaeological site on the northern bank of the wadi of Nahal Oren (Hebrew)/Wadi Fallah (Arabic) on Mount Carmel, 10 km (6.2 mi) south of Haifa, Israel. The site comprises a cave and the small terrace in front of it, which steeply descends towards the wadi floor. The site was first excavated in 1941. Kebaran (Upper Paleolithic), Natufian (Epipaleolithic) and Pre-Pottery Neolithic A and B (PPNA, PPNB) industries were found. A PPNA village of some 13 subcircular houses and other structures stood on four artificial, closely set terraces. The buildings were similar to those of PPNA Jericho. Only one human burial was discovered at the PPNA village site. There were no grave goods in the burial pit, and the skeleton was complete with the exception of the skull, which had been removed - an early example of a practice better known from the later Neolithic. The remains of the PPNB village are far more scarce, but seem to be in continuation of the PPNA phase. During Neolithic occupation, the main source of food at the site appears to have been gazelles, and judging from the high incidence of immature gazelle bones, these animals were domesticated. The later shift to goat husbandry may have occurred because goats are less selective in their diets than gazelles, and can graze in areas where the gazelle would not fare well. Nahal Oren was occupied repeatedly over thousands of years by culture after culture, which means that it was a preferred site for occupation, rather than an occasional one. ^ Mary Settegast (1990). Plato Prehistorian (via Steve Gagné, Food Energetics: The Spiritual, Emotional, and Nutritional Power of What We Eat, Healing Arts Press, 2008 ed.). New York: Hudson, Lindisfarne Press. p. 3. Retrieved 27 January 2017. The recent and totally unexpected find of several grains of morphologically domestic emmer wheat at the Palestinian site of Nahal Oren also rises the possibility that grain was under cultivation as early as 14000 BC. This page was last edited on 29 March 2019, at 11:54 (UTC).